"Easily accessed and prompt service. Would definitely use again." "Very true. Definitely will recommend and do it again. I was flying at 4am and still was good. Thanks"
"Everything was perfect , will use it again , next time we fly"
"It was a very nice experience knowing that you don't have to wait for anybody , just take your car and go home." 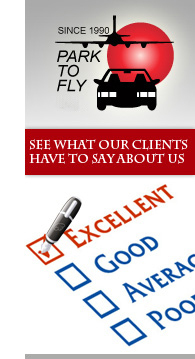 "Excellent Services!! The wait time was much less than expected!!" "I recommend the service. Excellent. The price per day is great. They had the lowest price in the area. Quick access to the MCO airport." "We have parked with you for years and never had any problems............."
"It is a privilege to park with Park To Fly we have always had very considerate, polite and professional service."